When I went home recently to visit my family in Maine I noticed mold spots on the ceiling in multiple rooms. 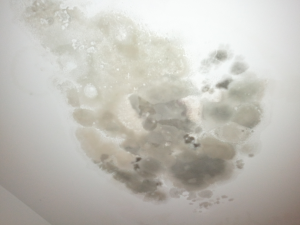 Roof and water damage from New England’s snowy winter caused the mold. So I called Mark Berry, EPA’s Region 6 Indoor Air Quality Coordinator in Dallas. He assured me mold in Maine is much like mold in Maryland or Midland, Texas. I learned a lot from Mark. Mold is a moisture issue: People think mold is a hazardous material. Most people do not realize that mold and mold spores are all around us. Molds live in the soil, on plants, and on dead or decaying matter. Outdoors, molds play a key role in the breakdown of leaves and wood. Molds produce tiny spores to reproduce, just as some plants produce seeds. 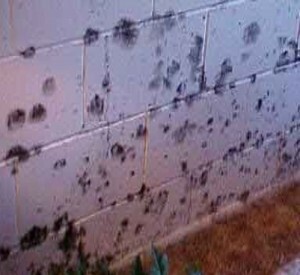 These mold spores can be found in both indoor and outdoor air, and settled on indoor and outdoor surfaces. Mold spores begin growing when they land on a damp spot, so it is important not to provide the moist environment mold needs to grow. To solve the problem, you have to find the source of the moisture first. If you removing the mold and the water remains, new mold will grow in the same area. Use detergent and water to clean up mold: Using bleach or some other harsh chemical cleaners can create a breathing hazard. If you use disinfectants or biocides, follow the directions, ventilate the area and exhaust air to the outdoors. Never mix chlorine bleach solution with other cleaning solutions that contain ammonia because toxic fumes could be produced. Don’t just paint over mold: Mold can grow between the paint and the wall. The paint merely acts as a temporary cover-up. The paint traps moisture, furthering the growth of mold. EPA gets the most mold calls from landlords and tenants in dispute: EPA attempts to educate callers, and to make suggestions for removing the mold. Callers need to consider the problem as a water issue and address the cause of the mold infestation rather than the symptom. There is more mold in the southern states, kind of: EPA gets more mold inquiries in humid areas because the mold continually gets fed more moisture which allows it to flourish. However, mold can grow everywhere and can exist in a broad range of temperatures and humidity levels. Although moisture is necessary for growth, there are molds that prefer drier environments and need much less water to survive. EPA does not clean the mold, but we do help people figure out how to solve the problem. We recognize the health danger to schools, homes and places of work. “I’ve got mold problems can you do something to help me?” is the question Mark hears most. EPA Region 6’s Indoor Air Quality program is a program primarily responsible for educating the public about indoor environmental issues, including health risks and the means by which human exposures can be reduced. The program educates the public about indoor environmental pollutants and sources of pollution, including mold. However, EPA does not have any regulatory authority to control mold in private residences nor do we have the resources to inspect individual homes. In most cases, if you can see mold, you don’t have to do any test. And remember that mold and mold spores are natural in the environment, so no matter where you live, sampling will result in finding mold. My family ended up putting in a new section of metal roofing to address moisture entering the building. Some other damaged areas were replaced. The entire building is now sealed tightly creating a warm and dry environment, just in time for this season’s snow and ice.